Every week of this outdoor Mister Sunday season, we’ll be asking Eamon or Justin to highlight an album that they’ll be playing in full at the beginning of the day. This week, it’s Justin’s turn. 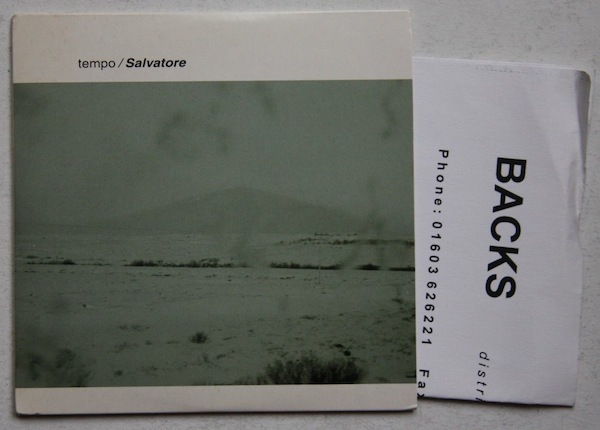 He’s chosen Salvatore’s Tempo album. This is what he has to say about it. When I got out of college in 2003, I dabbled in music journalism. Those were the days when PR companies would still send out CDs to writers, and it didn’t take long before I would get overwhelmed by piles of CDs. Luckily this album was one of the first I got, when it still felt really special to get new music in the mail for free. What made it all the more special is how psyched I was on the music. (I quickly discovered that most promos were mediocre, so finding one I loved in the early stages was like hitting a home run at my first at-bat.) Tempo became a staple album for me. It still reminds me of that time in my life, riding back from Beach Five at Robert Moses State Park in my friend Vance’s Jetta with the window open and my best friends in the back seat. The music is expansive, with large debts to krautrock and post-punk (when I interviewed them, the Salvatore guys told me that they loved Liquid Liquid; it recently dawned on me that they probably named the band after the Liquids’ lead singer and percussionist Salvatore Principato). Beyond the homages to the past, the record also felt very contemporary. You could tell they listened to a lot of sample-based electronic music. I don’t think sampling was involved in the records, but the drummer played repetitive breaks as if they’d been sampled. They were clearly also shoegaze fans. Guitar lines would only be a few notes long, but they’d hang in the air for ages. I recently pulled the album out, and it sounds as good as ever. I’m really excited to play it for you Sunday.